AND HOLY CRAP!!!!! Look at page 9!!!! VISION ALRIGHT!! Look at the new skyline pic to the right of the text! If Portsmouth looked like that, it would give Norfolk a run for it's money!!!! I still think the cities should merge and it would be great for the region. I think that of all the HR cities, Portsmouth and Norfolk, indeed, have the greatest chance of a merger. Imagine the city that would create! A sea of highrises spanning two sides of a great harbor-river (which will come to fruition either way). 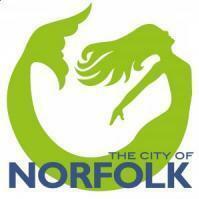 Over 330,000 residents, firmly establishing it (Norfolk, Portsmouth, or some combination of those names) as the second-city in the state. Either way... DANG! 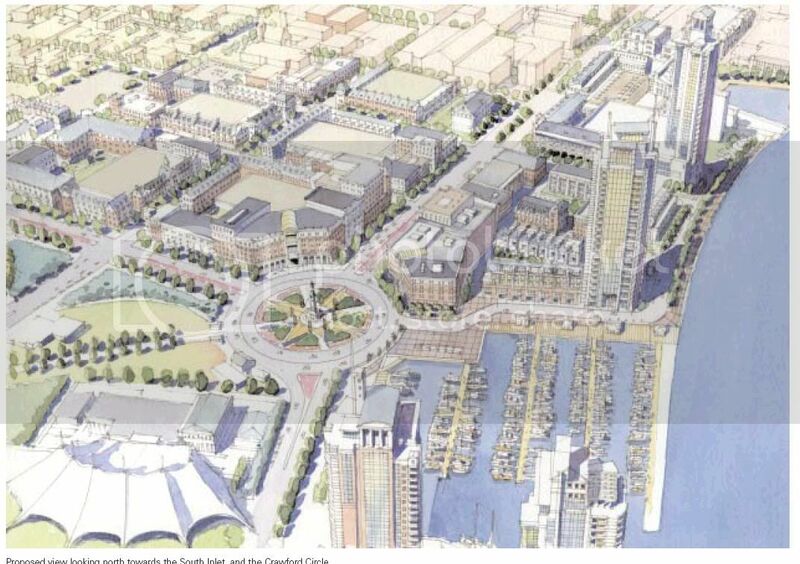 This is a new development that could very well be something to alter the history of Portsmouth, and from what I can see, it's by far the largest single urban-development initiative in this region. It makes towncenter look like something out of highschool. This is one of those truly big developments that you usually see in places like Miami and NYC. I mean come on, 6 towers in one project? Incredible. Do we know that it is really one project or something the city is trying to get developers to do? Well, they're starting in much the same manner as towncenter did. As towncenter, I'm sure this will morph and change over the years. While maybe not officially one "project" it is one "vision" where they plan on the major components to be completed around the same time. Yeah, I thought it was a several projects but one vision. A lot of the vision requires redevelopment of existing parcels. The city jail would need to be moved. Buildings would need to be bought. The open space portion around Ntelos Pav would probably be done as one project, though. Since Norfolk and Portsmouth are named after English cities, and the English love hyphenating names when cities are merged, then if there is a merging why not Norfolk-Portsmouth? It's simple and it flows easily. For your viewing pleasure. I'm working on a complete breakdown and synopsis of this project for the HR projects listing, I may even have to post it as a new post in the listing. Stay tuned. Oh, btw. I counted about 31 floors (I counted the very top portion as one floor even though it is probably a couple so i'm being conservative here ). The shorter building which is currently Portsmouths tallest is 25 floor. They're obviously looking to build somewhat of a signature tower here. I hope so! I still wish Norfolk and Portsmouth become one city! How about Normouth or Portsfolk? Nevermind. I'll go away now. I'm told that the Holiday Inn has a lease through 2006, so it's unlikely to close before then (we can always hope, though, can't we?). If even part of this scheme is carried off, it will be a great leap forward for the whole region. 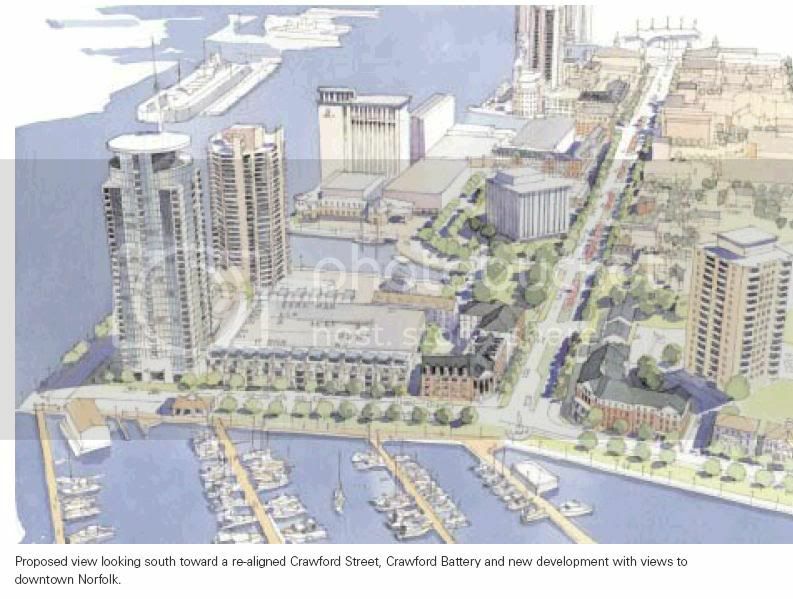 Getting the jail off the waterfront will also be a good thing. Money talks, and I'm sure if a developer thought that property were lucrative enough they'd buy out that lease. I'm keeping my fingers crossed. This thread has been seriously hijacked. All Housing real estate posts are being moved to the housing real estate thread. Please continue this discussion in there. The Norfolk-Portsmouth names discussion has been moved to Hampton Roads off-topic. Ok, so I actually decided to read the .pdf file instead of just looking at the pictures and there are a couple of things to clarify. According to the file, developers have already submitted proposals for the sites in question. This is not a pipe dream, people actually want to build on these properties now. Phase one will be the 2 towers on crawford circle. The tower for the Holiday Inn site (termed the "Mile zero tower" does not come til much later. Here is an excerpt, there is just way too much info in that document to copy and paste in full. This is great. I wonder what has all the sudden caught developers eyes for this region? The city of Portsmouth is on "Step Two, the Pre-Proposal Meeting" of the RFQ. The "Sealed Proposals" are due on Jan. 6th. By January 25th contract negotiations will have started and we should have some hard info. on this BIG project. Great find Willy! You've really been on top of the Portsmouth info. I am very impressed with how quickly they are moving on this project. And as you said this is a HUGE development. If they keep it up at this pace, we may see construction start in a years time. Great news! Glad to know that Portsmouth is progressing somewhat! uhhhh ohhhh ... Glen Allen = Richmond. Hopefully Russ won't be too angry about that! I'll take good care of them when they come down here!